Pacific Gold Macadamia Pty. Ltd., Bundaberg, is a BRC, HACCP, and WQA accredited facility that employs up to 180 staff at peak season. The harvest stretches from April to November and 50 growers supply the bulk of the macadamias processed in the Bundaberg facility. Macadamia orchards are located in Australia’s East coast in some of the most beautiful rainforest and subtropical environment. This is the area where macadamias, which are native to Australia, were first discovered. Macadamia production is also growing rapidly in South Africa, China and other areas of the world. Craig emphasizes that the Napasol investment was made “to secure PGM’s future in the industry and make sure the products we produce are safe." Napasol AG, Zug, Switzerland, sells its Pasteurization equipment worldwide for nuts, seeds, herbs, spices and other low moisture foods. In the tree nut industry, it has validated processing lines with customers pasteurizing Macadamias, Almonds, Walnuts, Pistachios, Hazelnuts, Pecans, Brazil nuts, and Pine nuts to the 5-log pathogen reduction standard widely required by retailers and industry. 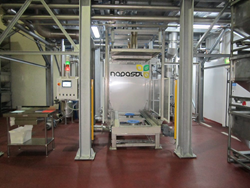 Dr. Cameon Ivarsson, COO of Napasol says “The need to pasteurize is obvious and with this PGM equipment Napasol is the market leader in pasteurization equipment for Macadamias."